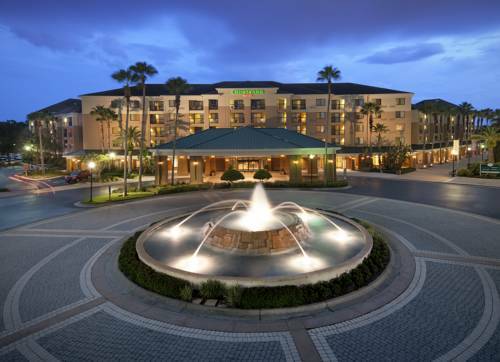 Retreat to relaxation at Courtyard Orlando Lake Buena Vista in the Marriott Village, our stylish Florida hotel near Walt Disney World Resort with newly renovated guest rooms. Popular among business and leisure travelers, we feature modern amenities including complimentary wireless internet access, on-site dining at The Bistro - Eat. Drink. Connect. and free shuttle service to all Disney theme parks. During downtime, unwind and grab a bite to eat in our updated lobby, let the kids swim at the indoor/outdoor pool, or get in a workout in our modern fitness center with free weights and cardio equipment. Convenient for purchasing snacks before heading off on an adventure, The Market has grab-and-go food, drinks and various sundries available 24/7. Host productive professional meetings or fun-filled social celebrations in one of our six flexible event spaces. Catering and high-tech audiovisual services are available upon request. No matter the occasion, kick back and relax at our Lake Buena Vista hotel. Your food and beverage destination for refreshing breakfast choices in the morning and a variety of options in the afternoon and evening. The Bistro also offers specialty beverages made with Starbucks coffee to help you get a jump on the day.